Resist! is the third book in the Radical Future series: publications written and edited by young* activists, journalists and artists calling for radical alternatives to the status quo. We’re interested in social justice, liberation and collectivity, and the ways young people are organising to create change. If you think mainstream politics is a dismal failure and you still have hope we can do better, this book is for you. The first book in the series, Radical Future: Politics for the next generation, was written before the 2010 election (remember back when things were bad, but we had no idea how much worse they were going to get?). The follow up, Regeneration, was published in 2012, and received over 50,000 downloads. Resist! 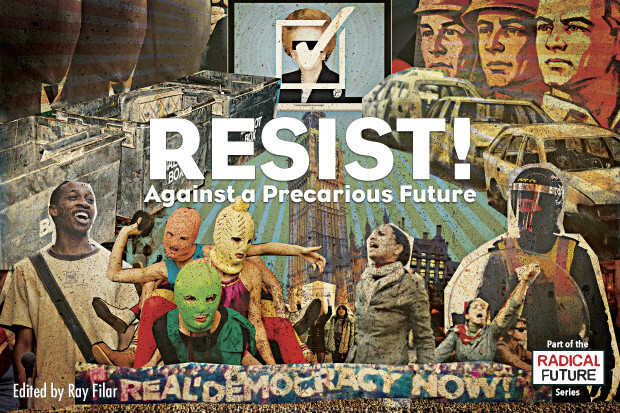 includes chapters about youth activist movements, re-envisioning work, feminist economics, direct action against the housing crisis, alternative media and organising after the London riots, from contributors like feminist campaigner Polly Trenow, activist Wail Qasim and openDemocracy journalist Adam Ramsay. It is edited by journalist and openDemocracy editor Ray Filar. We’re really excited about this next book and can’t wait to get it published. But to get there, we need your help. Like the first two books in the series, we want to make Resist! as accessible as possible by also offering it as a free ebook (as well as a paperback version). But ironically, publishing a free ebook is expensive. The publisher, Lawrence & Wishart, is covering most of the costs, but we need help with the final £2000. And we need it sharpish to get it out before the general election. So that’s why we’re asking you to donate. Your money will go towards typesetting, copy editing, proofing, and promotion. We’ve put together some amazing rewards. As well as beautiful merchandise designed by our talented cover artist Yoav Segal, we’re harnessing the talents, pub-debating skills and canal boats of our contributors. We’re offering prints that you can put on your wall, and tote bags with our cover art on. You’ll also find a great selection of workshops, excursions and experimental fun, all there to encourage you to part with your cash. If we get more money than our target, we’ll divide it up to pay everyone who has given their time for free. Anything over that we’ll put towards the next book in theRadical Future series. You can read the first two books in the series right now. For free! Sarah Allan, Craig Berry, Matthew Cheeseman, Rhiannon Colvin, Sean Farmelo, Ray Filar, Robbie Gillett, Deborah Grayson, Noel Hatch, Izzy Koksal, Ben Little, Wail Qasim, Adam Ramsay, Niki Seth-Smith, Mike Shaw, Polly Trenow, Matt Adam Williams.